Facebook Celebrating ‘The World Wide Web”s’ Birthday!!! 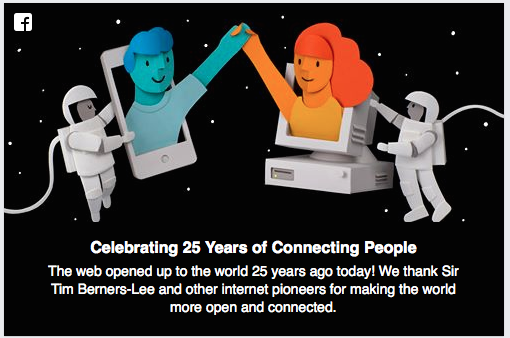 We love to see Facebook celebrating the 25th Birthday of the World Wide Web! Today we celebrate the gloriously gossipy technology, which has brought us all together! On August 23, 1991 — exactly 25 years ago today — the public gained access to the World Wide Web for the very first time. Originally the space on this network where information, such as web pages and documents, are stored was designed and deployed by computer scientist Tim Berners-Lee … Which let’s remember does differ from the internet, which was first connected in 1969, and is the network that carries information. In 1980, Berner-Lee had created this personal database of people and software models at CERN… By doing this, he deployed the use of hypertext, which is the link to where pages are linked to one another. Over the next ten years he developed and proposed the idea of a “universal linked information system” — initially idealized to help physicists collaborate, combining the internet with hypertext. The very first web page, which went live on August 6, 1991, was a short page explaining what the World Wide Web actually was. Thanks Berner-Lee for creating The World Wide Web, who knew the Web was a Millennial too!